This 5 day artist challenge was originally took place February 2-6, 2015. Posted on facebook and instagram. 5 day artist challenge ….third post..I am going to theme by medium..Today I am going to post the art of body painting.. I call this one Alphabet Soup ( She is painted in a alphabet, each letter different style) I do many graffiti pieces like this. So I wanted to see if I could get it to flow on the body. 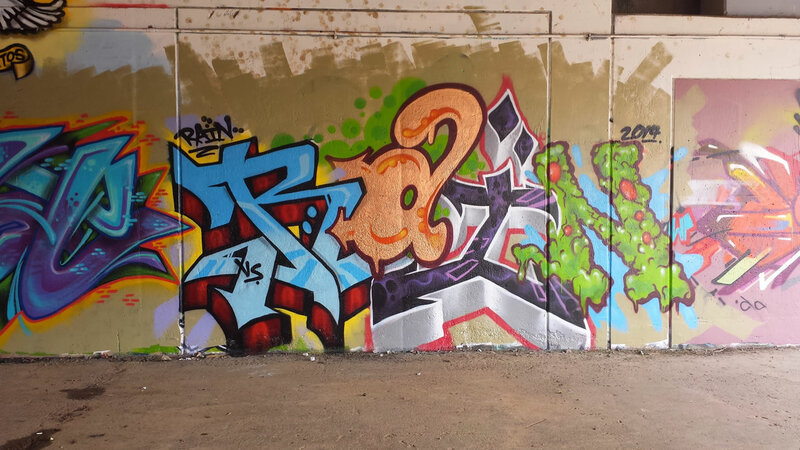 One thing that is challenging coming from a graffiti background and going to body paint is that the walls and pieces we paint are very linear (horizontal) and the body flows vertically. So it took me a while to figure out ways to make what I do flow with the body. I painted this lovely model about a year or so ago Photography by Gregory Maxx II. 5 day artist challenge ..day two..first post..I am going to theme by medium..Today I am going to post the 3d Cut Out Tags that I have been doing over the last year. I take a bunch of tags, figure out which one I like best, then digitize and clean up the tag a bit in the computer. Once I get it sized and configured how I want it I work with a local sign shop (Z-Signs) to have them cut in MDF using a C & C routing machine. Then I paint, prime, finish and seal the piece. 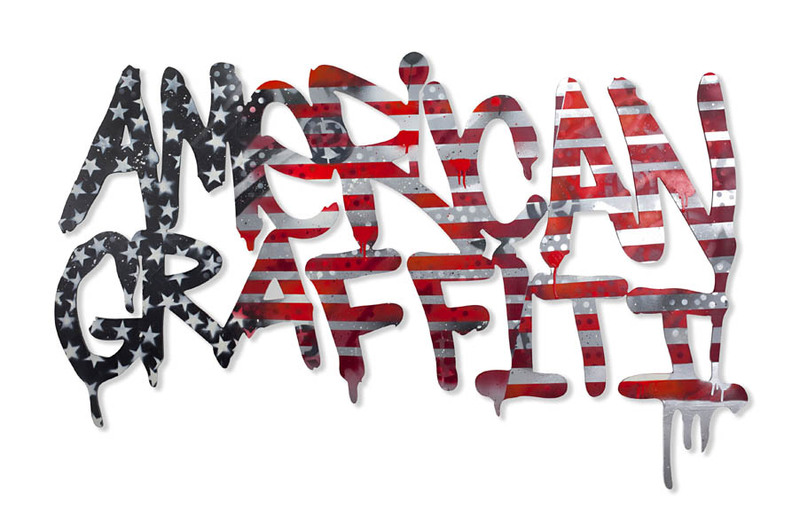 This one “American Graffiti” is on exhibit at the America: Through Artists Eyes Exhibit at the NJ State Museum until August 2015.— with Wills Kins and George Zienowicz. 5 day artist challenge ..day two..second post..I am going to theme by medium..Today I am going to post the 3d Cut Out Tags that I have been doing over the last year. I take a bunch of tags, figure out which one I like best, then digitize and clean up the tag a bit in the computer. 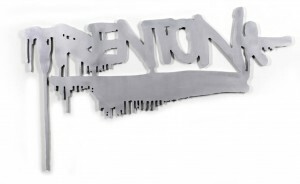 Once I get it sized and configured how I want it I work with a local sign shop (Z-Signs) to have them cut in MDF using a C & C routing machine. Then I paint, prime, finish and seal the piece. This piece “Jersey” is my most popular piece. I also do custom orders and custom names and they can be painted in any color scheme. 5 day artist challenge ..day two..third post..I am going to theme by medium..Today I am going to post the 3d Cut Out Tags that I have been doing over the last year. I take a bunch of tags, figure out which one I like best, then digitize and clean up the tag a bit in the computer. Once I get it sized and configured how I want it I work with a local sign shop (Z-Signs) to have them cut in MDF using a C & C routing machine. Then I paint, prime, finish and seal the piece. This piece “Trenton” started it all. This one is based on a popular tshirt design I sold in silver and gold.. To mimic a chrome krink drip mop. I also do custom cut outs, names and colors can be suited to fit the individual. Product shots by Andrew Wilkinson! 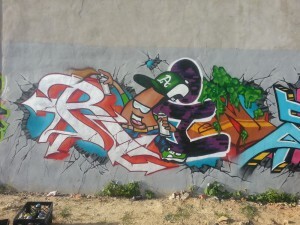 5 day artist challenge ..day three..first post..I am going to theme by medium..Today is going to be Graffiti Pieces.. Return of the block heads I painted this piece in West Philly in 2008 the site of the last BBOY BBQ..I always felt good vibes there and I painted some of my best pieces there..I really had fun with these part of the block head character series that I did untilChangerous Sixty-Three put the kabash on it.. I thought that the characters were so original..he showed me black book sketches that were similar that he did 5 years earlier..haha I always liked the color and flow of this piece. 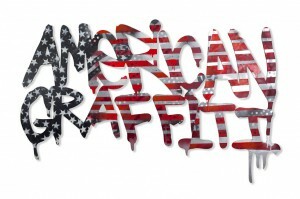 5 day artist challenge ..day three..second post..I am going to theme by medium..Today is going to be Graffiti Pieces.. This piece was painted in 2010 at a building that TerraCycle use to rent in the Mill One complex, In Trenton. I think it is still there. It is visible from the New Jersey Transit NorthEast Corridor Line. This one was filled with a roller and outlined and detailed with spray paint. This was one of the larger stylized pieces that I’ve done. 5 day artist challenge ..day three..third post..I am going to theme by medium..Today is going to be Graffiti Pieces..Being Native this is one of my favorite walls on East State Street (Across from PJ Hill Elementary School). This is the second iteration of this wall. we did this wall twice and used exterior paint and primer but both times areas of the wall peeled, I think it has to do with water damage to the wall. 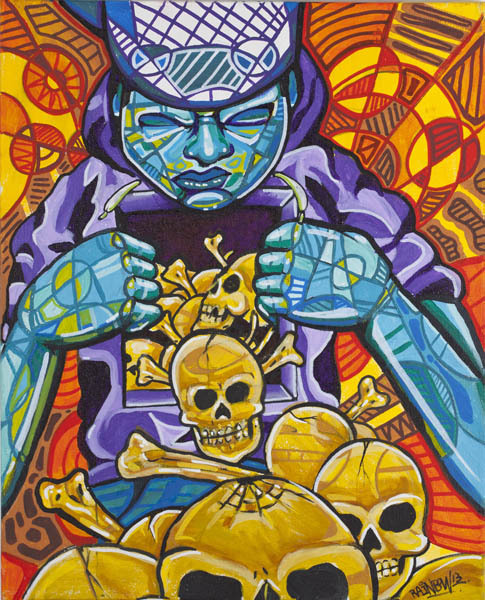 Dave MekOne Klama killed the southwest styled background. Had Fun with the beveling, representing my tribe(Quechan ) in the feather! 5 day artist challenge ..day four..first post..I am going to theme by medium..Today is going to be Canvas..This piece is from my Dynamic Abstract Series. 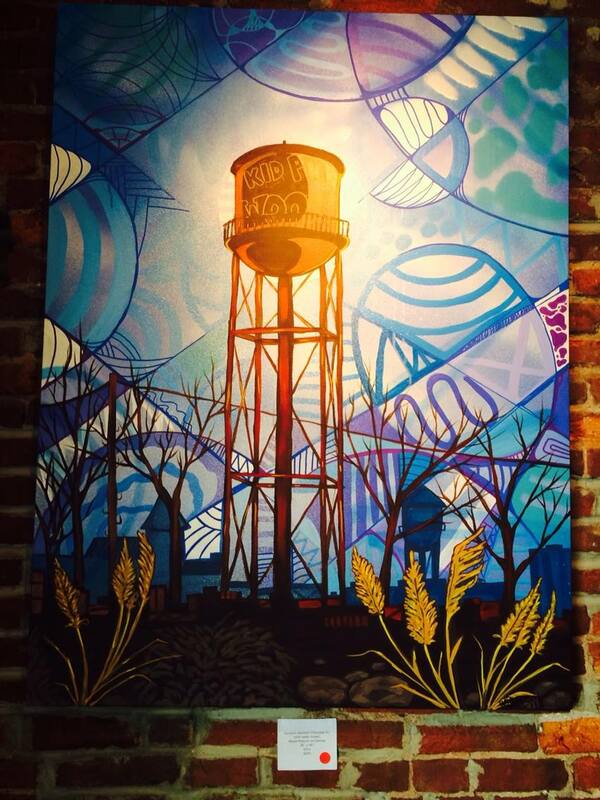 This water tower painting was based on the water tower off Olden Ave between New York and North Clinton Aves. This was one of the first big spots that I remember people painting both writers and political. When I walk the trail that goes along RT 1 it is an interesting area of the city because it is so secluded so wild. I tried to have that feeling with this piece. This piece was one of the first pieces that sold at my Politically Incorrect Show at Trenton Social Last Year. 5 day artist challenge ..day four..second post..I am going to theme by medium..Today is going to be Canvas..This piece is from my Dynamic Abstract Series. This piece “Inside Out” is very personal to me. It is about cleansing your soul. Bringing your skeletons out of the dark closet and into the light so they can die in the light of exposure. This piece was also sold I have prints of this piece available on 100# Gloss, 12×18 paper, signed $10+s/h contact me for details. 5 day artist challenge ..day four..third post..I am going to theme by medium..Today is going to be Canvas..This piece is from my Dynamic Abstract Series. This piece “Masks” , everybody wants to be happy but we aren’t happy all the time. We all put on masks strong, tough, happy, confident.. But the masks have to go we all must be who we are flaws and all. 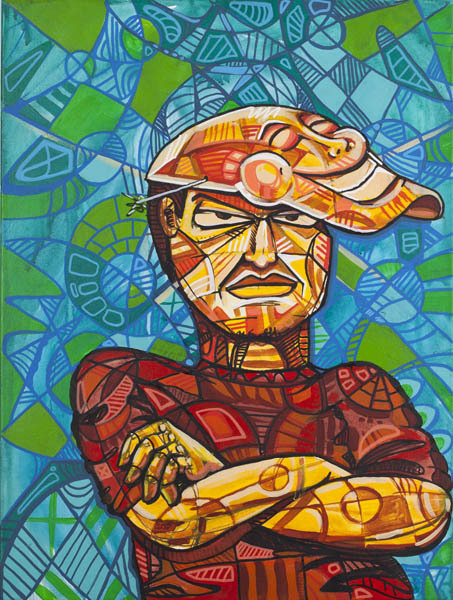 This piece had a caption in the NY Times promoting my Politically Incorrect Show at Trenton Social.This piece was also sold I have prints of this piece available on 100# Gloss, 12×18 paper, signed $10+s/h contact me for details. 5 day artist challenge ..day five..first post..I am going to theme by medium..Today is going to be Mixed Matched Graffiti Pieces…Aka ADD Style..haha..I originally started to create this style to try something different and try and have each letter as it’s own piece yet try and get them to flow together and have the colors work..It’s a challenge for me and I find them fun and I like to add in characters here and there. This piece was painted at the Benchers Union Jam in Erie, PA in 2012. Added in the eyeball characters as a nod to the old school. Painted this big wall with Gentrifried Prufrock and Ray Demerock Llopiz. 5 day artist challenge ..day five..second post..I am going to theme by medium..Today is going to be Mixed Matched Graffiti Pieces…Aka ADD Style..haha..I originally started to create this style to try something different and try and have each letter as it’s own piece yet try and get them to flow together and have the colors work..It’s a challenge for me and I find them fun. I painted this wall in North Philly (7th and Berks, I think!) with bark, shue, moon, joe and a few other people. I think it is still running. 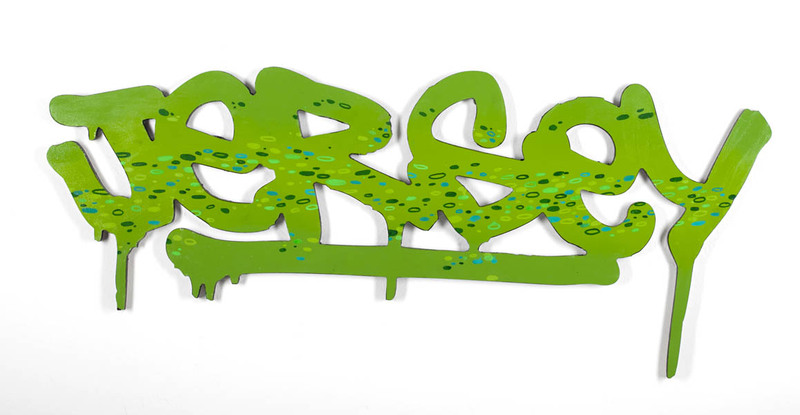 had fun with this one weird a shaped character, busting out the background, slime on top of the letters etc. 5 day artist challenge ..day five..third post..I am going to theme by medium..Today is going to be Mixed Matched Graffiti Pieces…Aka ADD Style..haha..I originally started to create this style to try something different and try and have each letter as it’s own piece yet try and get them to flow together and have the colors work..It’s a challenge for me and I find them fun.With Dave Orantes, Wiser Oner, and snuck in Ian Ochouno (was already on the wall). 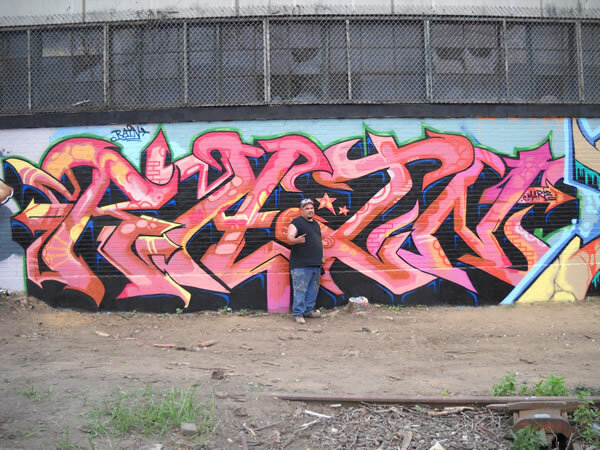 This was the last time I painted with Wiser. 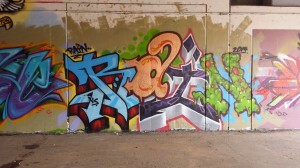 On Sunday I will be traveling to DC to paint with Wiser, Kasso, and HKS 181.